Jackson is still not right – and, on top of that, Slip was sick all over the floor! I seem to have spent the day on my hands and knees washing floors! It has turned very cold here and John has lit the fire – that means his dust campaign is on hold as the fire makes more dust!! I am cooking pork chops for dinner and then we are going out for a drink. Life seems rather flat at the moment, perhaps things will perk up at Easter! Back tomorrow. Today has not been a good one so far. John has bought an air purifier as he thinks there is a lot of dust in the house. He decided we must spring clean the bedroom which involved vacuuming under the mattress, dusting all cupboard tops and so on. I had to vacuum inside all the clothes cupboards and behind the radiators – I hate vacuuming!! Then he set the machine in motion – it caught very little dust, I think he has a phobia about it. Next in line for a blitz is my office – ugh! Jackson has an upset tummy – I have not deviated from his usual menu and so I do not know what has caused it. He had an accident” in my office and I have had to scrub the carpet – I am rapidly starting to feel like a house maid. I shall just feed him biscuits for a day or two. Nothing new on the yarn front to report. I am going to cook a beef curry now! Back tomorrow. 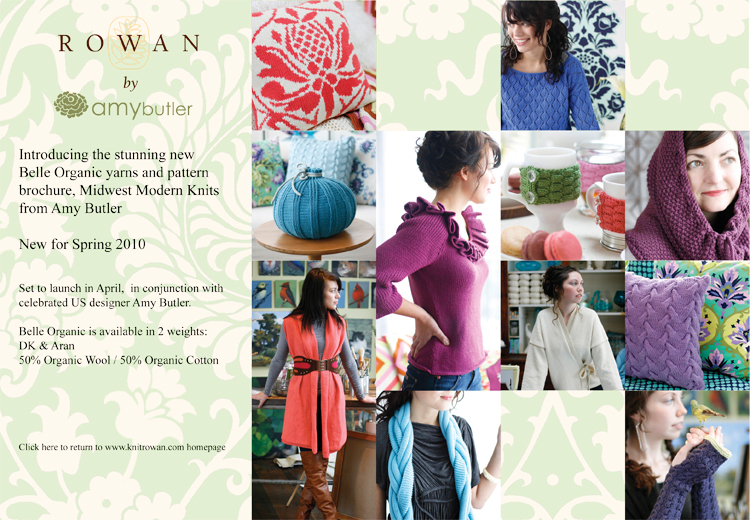 The pic above is the flyer for the new Amy Butler yarn range together with some of the designs in the new book. I do not know when it will all arrive but I doubt if it will be before Easter now. On Saturday night we went out with Lyn and Steve for a meal. I had avocado pear baked with smoked bacon to start with and the others all had whitebait, then John and Steve had steak, Lyn had fish pie and I had noodles with prawns. They all had gigantic slices of Raspberry Pavlova – I declined!! I am lucky in that sweet things do not really appeal to me and so do not find it any hardship not to have desserts. Jackson can nearly open doors now – he hates it if I go into a room and shut the door. We do not allow him in the kitchen or bedroom but he does his best to open the door and come and find me. I may let him sleep on the bed with me when John goes to Ireland fishing. He is thinking of going next month and the good news is that he will most probably go with Kevin which means I will not have to do that dreaded drive to the airport. Even if Kevin does not go, I do not think John and his fishing rods will fit in my car – they would if the roof were down but not with it closed. I am hoping that the swallows will come back and nest this year. John has put some ledges up for them in the open fronted car port. Now I am going to give Jackson some practice in his walking jacket, it will soon be warm enough for him to come outside on a lead. Back tomorrow. Sorry I have not written for a few days. My scalded hand has been very troublesome and slows me down. It is still a horrid livid red – rather like a birth mark. 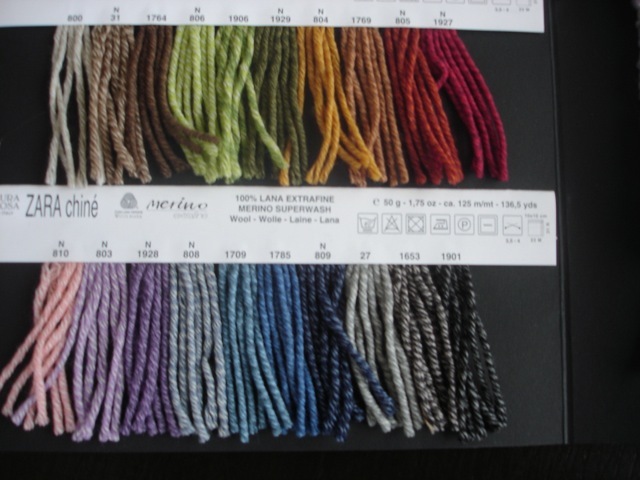 I am hoping the Amy Butler yarn will arrive next week and also the Filatura. 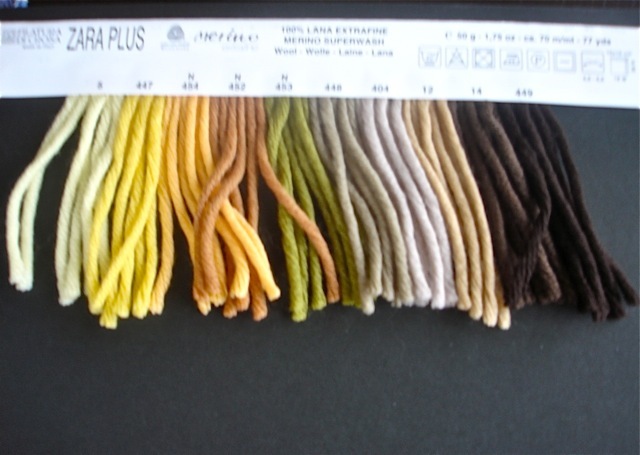 I am also getting some Silk Garden Chunky at a good price – God knows where I am going to put it! I am going to look for some new trousers tomorrow – I seem to live in jeans and really could do with some smarter ones. Jackson has grown and the good news is….John has taken to him. He is not a cat person but Jackson seems to have won him round and he mentions him to everyone we meet and also encourages him to sit on his lap. I am pleased about this as it makes for an easier life. He is a beautiful cat to look at but it is his personality which is the most endearing thing. He only has to be told NO once and he knows that it is a bad thing to do. I must persevere with the walking jacket!! Now I am going to make some rhubarb and ginger fools – rhubarb is in season here! Back tomorrow. This is Filatura Zara Chiné which has a marled appearance. It knits as standard DK and has a nice crisp finish. I had an accident last night. I was filling a hot water bottle for Jackson and I somehow missed the mouth of the bottle which I was holding in my left hand and poured the hot water over my hand. It was agony and looked as if I had a scarlet glove on. Lots of blisters formed and John pricked them. It is not so painful now unless I put my hand in hot water or anywhere near a source of heat such as the oven. No real news – I am looking forward to Sunday when we put the clocks forward and it will be lighter in the evenings. Back tomorrow. Oh, no! I have another sore throat – surely not another cold coming? I must take a Day Nurse! Jackson has grown so much particularly in height. He can now easily stand on his hind legs and see into the bath when I am in it whereas he used to have to stand on the scales. He walks around the edge of the bath in a perilous way – I am terrified he will fall in and claw me. Nothing new on the yarn front except that a new shade of Cotton Glace arrived today – Garnet. I am going to sit down now and have a rest….back tomorrow. I had my hair cut this morning and did some grocery shopping. John and Slip were over the wood until lunchtime and then, directly after lunch, they went back to the wood. They came back at 4.0pm and now John has gone over to the fishing lake and so I am not best pleased! I am beginning to feel like some glorified sort of housekeeper! We are supposed to be having smoked salmon and I have it all ready. Then we are going out for a quick drink before coming back to watch the game of rugby on TV. But if he does not hurry up we shall not have time to go out! 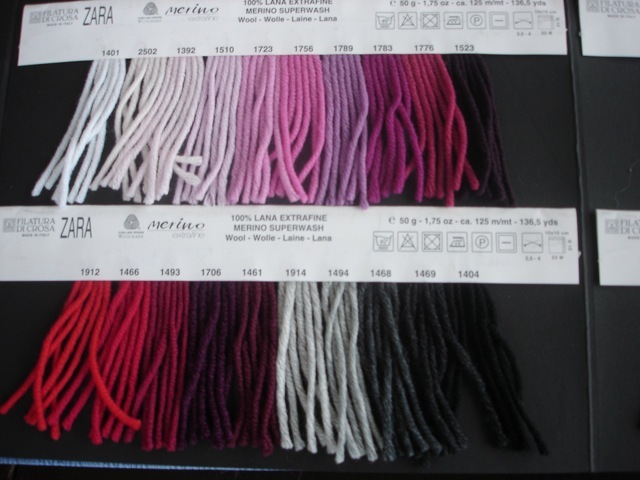 Today’s pic is of part of the Filatura di Crosa Zara Plus shade card – I will post some more shades tomorrow.